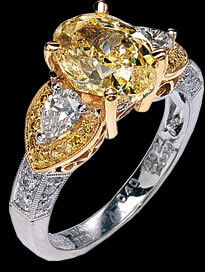 Our Selection: We have a vast selection of Yellow Diamonds, including all grades and colors. Yellow Diamonds are classified by color categories, including fancy and vivid yellow, fancy intense yellow, deep yellow diamonds, light yellow and more. All colors of diamonds are available at Joden World Resources. We offer custom services, original designs, unique settings in platinum or gold, antique and modern styles. We also have a limited selection of antique yellow diamonds. We offer gems and stones certified by the GSA for quality, color, and authenticity. On this site we have information on the history and popularity of yellow diamonds, how they are graded by color, and a searchable catalog of past and present items to give you an idea of the range of available items in our store.